Boxing: Men - welter 69kg, rd of 32, Adam Nolan bt Carlos Sanchez Estacio (Ecu), 14-8 (6-3, 5-3, 3-2). Fights Andrey Zamkovoy (Rus), last 16, Fri Aug 3, 21.45. Equestrian: Eventing - After Day 2, dressage. =27 Camilla Speirs (Portersize Just a Jiff), 47.60, 32 Aoife Clark (Master Crusoe) 48.90, 53 Joseph Murphy (Electric Cruise) 55.60; 61 Mark Kyle (Coolio) 58.70, 64 Michael Ryan (Ballylynch Adventure) 60.20. Teams (best three results) : 1 Germany 119.10, 2 Australia 122.10, 3 GB 127.00….10 Ireland 152.10. 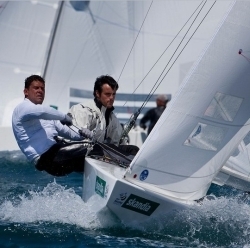 Sailing: Men's Star, Peter O'Leary, David Burrows. Race 1, 2nd (+0.32), 24.42. Race 2, 6th (+0.52). Ireland lie 2nd behind Brazil with 8 pts. Swimming: Women - 100m breaststroke, Sycerika McMahon; ht 4, 8th, 1:08.80 (+3.24); 26th overall. 100m backstroke, Melanie Nocher; ht 2, 3rd, 1:02.44 (+.84); 33rd overall. 400m freestyle, Grainne Murphy; Ht 4, 8th, 4:19.07 (+15.51).